Raymond “Ray” LeFevre Miller, age 95, passed from this mortal life into life eternal with his Lord and Savior Jesus the Christ on the 20th of October 2018. He died at home in Jamestown, NY. Ray was born on the 5th of May 1923 in Newburgh, NY. He graduated from New Paltz, NY High School in 1941. He entered Hope College in Holland Michigan in September of 1941. 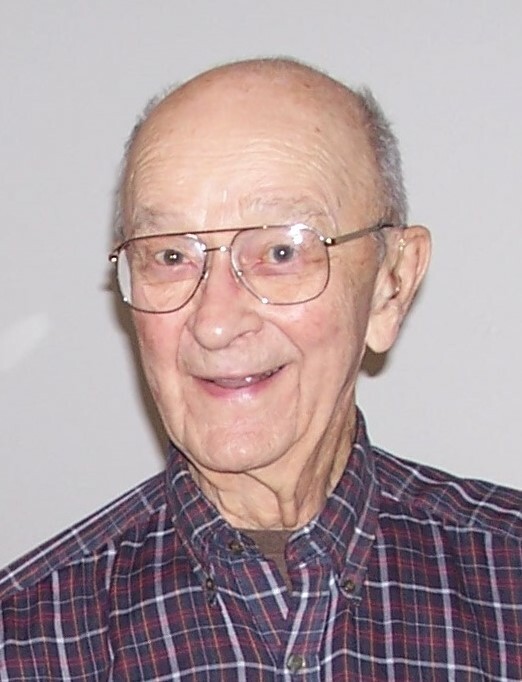 After taking three years off to serve in the Army Air Corps, he graduated with a BA in secondary education, with a major in chemistry, in February 1948. He then earned his MA in secondary administration from the University of Michigan in June 1954. His Masters studies were also interrupted by military service during the Korean War. During Ray’s freshman year in college he got a job at the Dutch Mill Restaurant where a pretty high school senior named “Micky” worked as a waitress. They were engaged to be married in January of 1943 just before Ray shipped off to serve in the Army Air Corps. Ray and Mildred Lorraine Russell were married on the 7th of July 1945 following his return from overseas duty. Following college graduation, Ray took a position as a chemistry teacher in Coopersville, MI to close out the school year. Then in September 1948 he began his new position as the chemistry teacher and high school principal at Dexter, MI. In January 1960 he accepted a job as a text-book salesman with Houghton-Mifflin Publishing (now Houghton-Mifflin Harcourt) and moved to East Aurora, NY. In June 1986 he retired and moved back to Michigan where he and Micky had built a retirement home on the shore of Hubbard Lake. Their next change of address was to Whitewater, WI in 2001 where they moved into an apartment on the campus of Fairhaven Retirement Community. In 2012, Ray and Micky moved to Jamestown, NY to live with their son, Roy (Valerie). Ray was sworn in to the Army Air Corps on Thanksgiving Day 1942. He reported for duty in January of 1943 and was sent by train to Miami Beach for basic training. Next stops were Clemson, SC, and Montgomery, AL, followed by Albany, GA for various levels of flight training. He was trained in the C-47, B-29, and B-50. Cadet graduation and commissioning as a 2nd Lieutenant took place on 23 May 1944. Ray then put in his 750 hours of combat flight time, flying a C-47 and serving as an Assistant Operations Officer while stationed in Kunming, China. His release from active duty into the Army Reserve (which, in 1948, became the U. S. Airforce Reserve) took place on 25 Nov. 1945. He was awarded the WWII Air Medal with Oak Leaf Cluster and WWII Distinguished Flying Cross. 1st Lieutenant Miller was called to active duty again in April of 1951 after the Korean War broke out. This time was spent based at Roswell, NM and in England for three months where he flew B-29s and B-50s as part of the Strategic Airforce Command. He was back to civilian life by Christmas 1952. During retirement years, Ray and Micky spent the warm months at their northern homes and the cold months were spent living from their “5th-wheel” camping trailer at multiple locations in Arizona and through the Gulf states. One summer they fulfilled a dream with a multi-week visit to Alaska. Overseas, they visited Israel. They also traveled to Indonesia and Argentina to visit former exchange students who had become forever family; Poedyo “Tomo” Wignijohoesodo and Gregorie “Goyo” Corbalan. And, of course, hours were spent at his favorite pass-times; fishing, gardening, being “Mr. Fixit” at the homes of his children and volunteering with “Nomads” on work projects – and the occasional game of golf. Wherever he lived or visited; Ray was always a faithful participant in the life of the Church. Through the years he held several different offices within the church as a lay servant who always wanted to give his all and do his best for his God. Ray is survived by his daughter Linda Kent of West Des Moines, IA; son Roy (Valerie) Miller of Jamestown, NY; daughter Janet (Roger) Wright of Omaha, NE; son Gerald (Amy) Miller of Grundy Center, IA – grandchildren Daniel (Trena) McCraine, Andrea McCraine, Laura (Brad) Sadler, Raymond (Vanessa) Miller, Rachael (Christopher) Coan, Andrew Miller, Melissa (Brian) Martensen, Eric Wright, Justin (Lora) Wright, Meghan (Jeff) Kohles, Ashley Wright, Jessica Miller and Matthew (Andrea) Miller; and seventeen great grandchildren. He was predeceased by his parents Ethel Atha LeFevre Miller and Raymond D. Miller, and by his wife Mildred who died in December of 2013 after 68 years of marriage. Calling hours will be from 10:00-11:00 a.m. on Friday the 26th of October in the chapel at the First United Methodist Church, 145 S. Prairie St., in Whitewater, WI. The Funeral will be held at immediately after the visitation at 11:00 a.m. with Ray’s sons, Gerald and Roy Miller, officiating. Burial will be at the West Lawn Memorial Park Cemetery in Racine, WI. Lind Funeral Home is assisting the family in Jamestown, NY and the Olsen-Gibson Funeral Home is assisting the family in Whitewater.